Here is my submission for this year’s global game jam: Heart Burn. Much like last year’s Global Game Jam, I wasn’t in attendance for all that much of the weekend after Friday night. 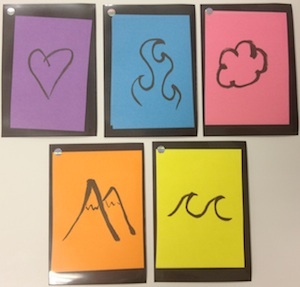 But while I was there on Friday night, I made up a quick 25 card deck using colored post-it notes and a calligraphy pen. There were five colors and five “symbols”. You can see them in this image. Already August, (who I collaborated with for the first time on last year’s game jam game Eat Thyself), has come up with some better looking artwork, and he and I are planning on working together to polish up the app’s look and feel, and possibly publish it to the app store. The concept and rules are quite simple: An iPhone app (code created during the game jam is up on bitbucket) will tell the players both whose turn it is to play, and what cards they can play. The game uses the “No cheating (please)” diversifier, which means that you’re basically on your honor not to cheat and play when it isn’t your turn or not to play the wrong cards. And it needs that diversifier, because, at least as it plays right now, the game is far too fast-paced to pay attention to anyone else’s cards! About halfway through the weekend, I decided I should make the game playable without the custom cards, so I spent most of my time on Sunday making it work with a standard Euchre deck. If we release the app, it’ll have a setting to play it either way. Here’s a clip on youtube of the game being played at the gamejam. This entry was posted in Board Games, Game Jams, My Games by Martin. Bookmark the permalink.